I have been a project manager since May for Utah Policy Daily, a publishing branch of The Exoro Group, a public affairs firm in Salt Lake City. The opportunity came to me before I was actually interviewed for the position. Several actions led to obtaining the internship, the first being my participation in a PRSSA Twitter Chat. There, I learned about the opportunity to contribute to PRSSA National’s newspaper, FORUM. Former FORUM Editor-in-Chief Amy Bishop was kind enough to allow me to write about the growth of the public affairs industry, a public relations niche that interested me. I interviewed LaVarr Webb, president of The Exoro Group, for the article. Fortunately for me, that interview was paired by something else—the internship. I sent the article to Mr. Webb when it was published and was offered an internship after following up with him weeks later. During the internship, I compiled data of Utah’s top leaders. This was for the purpose of notifications about social media seminars, offers for a newsletter with insights into Utah policy and invitations to networking events where these apprised individuals will collaborate about how to improve their communities and state. I also managed social media accounts. I am confident that the project will elevate the company to be the premier public affairs firm in the intermountain west region. Interview an industry leader and make a key connection. Stay in touch with the industry leader about the story. Send a follow-up email and notify him or her when the story is published. How will you land an internship after conducting the interview? 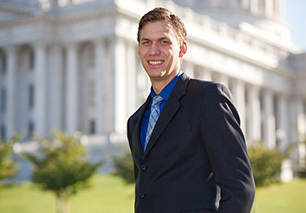 As a Utah State University student, Rhett Wilkinson hails the “true-blooded Aggies.” The co-founder of student magazine Aggie BluePrint, he’s interned for Utah media, U.S. Congress and the state’s governor’s communications office. That’s a great way to demonstrate professionalism and great writing skills! Good suggestion. Thanks for commenting, Heather! Yes, I definitely got to demonstrate those skills through my process, along with demonstrating a knowledge of the industry. At least, it worked for me! Thanks again for the comment.